Kawasaki Versys Forum > Kawasaki Versys-X 300 Forum > Versys-X 300 General Discussion > How to Post inline Pictures into Threads - no Photobucket! Last edited by onewizard; 06-02-2018 at 11:37 AM. 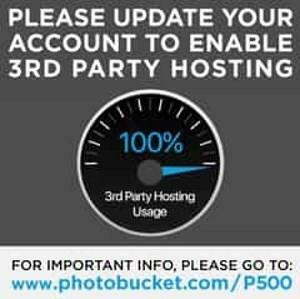 Photobucket has just gone back on their $399 hijack. Nice and simple - highly suitable for myself. "copy" and "paste the image into your post. With the options menu you can control image size storage and posting. Last edited by unstable_rider; 06-02-2018 at 10:08 PM. After what PHOTOBUCKET did to me and MY PICS when they went 'greedy', I would NOT use their service AGAIN even if they paid ME $19.95 per year! (AND I was paying them $39.95 yearly). onewizard and Brockie like this.